Here’s a massive shortcut: click to download my Systems Templates directly into your Google Drive. Below I’ll explain how to organize your procedures / systems / documentation. I recommend you use Google Drive. To see one of these live, fully completed, download the Systems Templates mentioned above. Your Master List of Procedures is “Grand Central Station” for all your procedures. 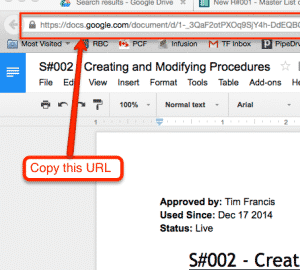 Using Google Drive, create a new Google Sheet, which will open a blank, new spreadsheet. 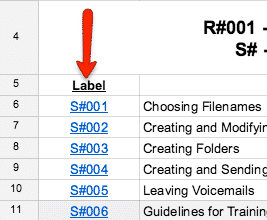 Name it: R#001 – Master List of Procedures. At bottom of spreadsheet, click the (+) button to create two new tabs. As my company got bigger, we had more and more procedures. To manage it all, Sarah (my Assistant) added the concept of three tabs at the bottom. This allowed us to visually separate all documents into their respective categories and find procedures more quickly. Like I said, you can skip all this work if you download my Systems Templates. 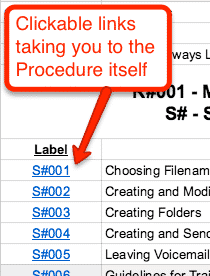 The first column, “A,” is where you’ll create all your procedure labels. I learned this method a few years ago (2011?) when I stumbled across an ebook called Source Control by David Walsh. I’ve been using the method ever since – thanks David! S: System or procedure explaining how to do accomplish something. R: Reference document you’ve archived for future reference (doesn’t explain how to do anything. Note: “R” is specifically for company-wide reference documents. Personal reference docs should probably go into your Evernote instead. T: Template docs go in here. 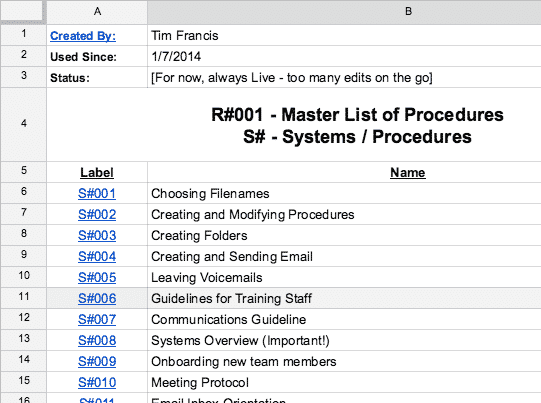 Separating the three types makes it much easier to find docs within your Master List of Procedures. Your labels will be numbered sequentially. Start with 001 and work your way up over time. Very simple. While helping the Ryan Levesque team get setup with procedures in their business (BTW, they’re stellar – check out Funnel Specialists), one of their VAs named James came up with this brilliant idea. STEP 1: In the Procedure itself (not the Master List of Procedures, but the Doc / Sheet where you’re writing the Procedure) copy the browser URL. Now your entire Master List is clickable, making it much quicker to go directly to your procedure! A few tips for choosing the name (not the label) of the procedure. Don’t! If you do, ALL of your procedures will have the same starting words. 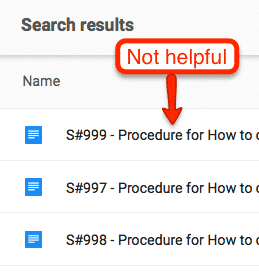 This makes it easier to find your procedure from the main Google Drive search bar. I don’t mean to sound like a broken record, but save yourself a lot of work (and see the real-deal in action!) 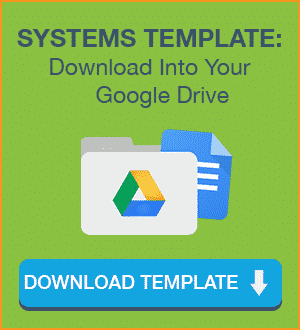 by downloading my Systems Templates directly into your Google Drive. I will do my best to answer questions in the comments below. If you’d like to guarantee you’ll get your question answered, consider joining the Profit Factory “Builders’ Club“, a private, paid, online group where entrepreneurs meet to build systems, hire winning teams, and generally build their “Engine Room” so they can work more *on* their business, and less *in* it. P.S. It’s Mike Rhodes, world-class Adwords consultant (and co-author of The Ultimate Guide to Google Adwords, alongside Perry Marshall and Bryan Todd) who twisted my bloody arm until I put together the Systems Templates. We can all thank him for the clever idea and gentle (?) nudge for me to get them built. In today’s “always-on” world, the 80/20 Rule is more important than ever. We face greater complexity, speed, and connectivity than any generation of entrepreneurs before us. Cutting past the 80% noise to find and focus on the vital 20% that really matters is the only way we’ll maintain sanity. What was once a casual analysis tool, the 80/20 Rule is now a daily discipline necessary for success and survival. The 80/20 Rule (a.k.a. Pareto Principle), was discovered over 100 years ago when Italian economist Vilfredo Pareto noticed how 80% of his country’s land was owned by just 20% of citizens, and – curiously – 80% of his garden peas came from just 20% of peapods. Since then, all of the world’s most successful and iconic entrepreneurs and investors have used versions of the 80/20 Rule to amass incredible fame and fortune. 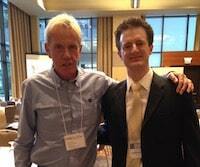 Amongst them, Richard Koch (pictured above, beside me) and Warren Buffett. In The Tao of Warren Buffett, authors Buffett and Clark report that 90% of Warren’s $60 Billion empire is thanks to just ten investments. Not hundreds of investments – just ten. They further explain how Warren deeply values what a firm doesn’t do just as much as what it does. What is the 80% (or more) the firm will leave alone? In his 1990 letter to Berkshire investors, Buffett proclaimed, “Lethargy bordering on sloth remains the cornerstone of our investment style.” Billionaires GET IT. And yet entrepreneurs continue to shrug casually, indifferently at at the 80/20 Rule, never really taking it seriously, opting instead to scratch away furiously at their To-Do list, 80-hour week after 80-hour week. Below you’ll learn what the 80/20 Rule is, how to take advantage it, and what brutal consequences you may face if you ignore it. Thank-you Perry Marshall and Richard Koch for inspiring me to study and integrate 80/20 into all areas of my life, both business and personal. Growing up we learned (erroneously) life is 50-50, where everything is equally important. In school, a strong report card meant doing well across all subjects, all classes contributing evenly to our average. Socially, everyone was supposed to give and receive equal treatment. If you gave a Valentine’s Day card to one person in class, you’d better give one to everyone. At family reunions you’d better hug everyone, including loud, obnoxious Uncle Norm who embarrassed you in front of everyone and stunk horribly of cigarettes. Despite their best intentions, our teachers at home and school were inaccurate about 50-50. There’s actually very little 50-50 in life. In reality, it’s all about 80-20 where 20% of inputs generate 80% of results. Remember the one bully in class created 80% of havoc. The one or two girls got 80% of boys’ attention. And – fondly – one or two “best friends” who were repeatedly by our side as we created 80% of our most-cherished childhood memories. 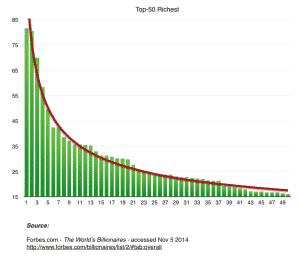 In 2014, I took the list of the Forbes 500. 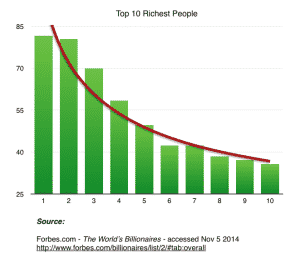 Looks suspiciously like an 80/20 Skew curve, wouldn’t you say? I did the math, and 80% of all wealth on the Top-50 list is retained by only 34 people. Technically it’s “only” an 80/68, but still acres away from 50/50. 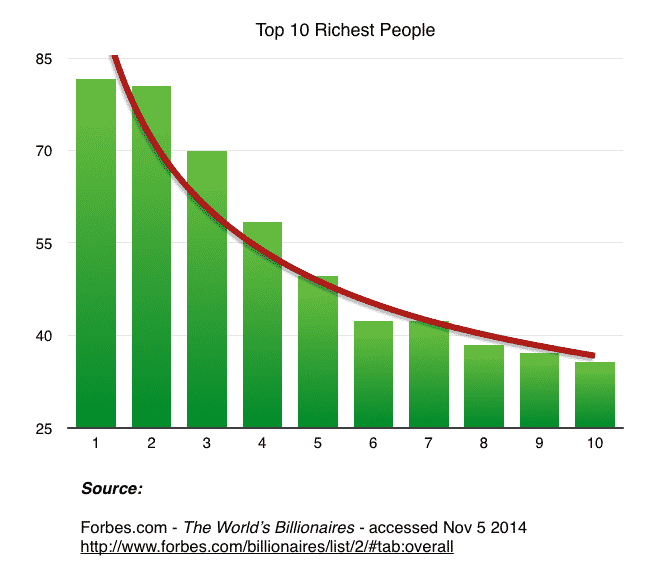 It doesn’t matter how much we zoom in or zoom out, the skew curve shows up again and again. Whether it’s just the Top-10 richest people in America, or the entire United States’ population of 300 Million people, 80/20 is alive and well. This is an educated guess, but you probably spend 95% of your online dollars on 10 or fewer websites (Amazon, eBay, Zappos, Victoria’s Secret… sounding familiar?). Considering there’s now approximately one billion (with a B) websites online, those 10 websites represent a 95/0.000000005, which is far, far, far more extreme than 80/20. And within those 10 websites that get 95% of your online dollar, there’s probably one or two that trump all others combined, representing a second-layer of 80/20. According to Pew Research conducted in 2011, the average American has 634 people in their network, including friends, family, coworkers, and other acquaintances. In a 2004 poll, Gallup discovered Americans (on average) have approximately nine close friends. We see 80/20 appear: of 634 contacts, only 9 (or 1.4%) are considered close friends. A 2010 study done by Cornell University went further, revealing Americans have – on average – two really close friends, people they’d consider confidantes to share life’s most personal matters. Another 80/20 has emerged: of nine close friends, only two are close enough to be confidantes. In summary, out of 300 Million people in the US, Americans have (on average) 634 contacts, of which nine are close friends, of which just two are true confidantes. That’s three levels of 80/20 playing out perfectly, and one helluva skew curve. As we’ve already seen in the examples above, often business and life are harsher than 80/20. This shows up in two (related) ways. Secondly, there’s actually an 80/20 inside of each 80/20. Let’s say you’ve got 100 books on your bookshelf. 20 of them represent your favorite. But of your favorite 20, there’s just 4 books which are your prized possessions. And perhaps 1 of those 4 is so meaningful, you’d literally take it to the grave with you. That’s the multiple 80/20s stacked on top of each other. In anything – people, customers, opportunities, friends, lovers – drilling down to the Top-20 is only “round one” of thinking. Push for the second round of 80/20 and you realize a full 64% of your success (or failure) can be attributed to just 4% of your efforts. Keep pushing for extra rounds until you’ve hit the end. It’s fascinating and fun to learn about 80/20 and consider how it shows up in life. But the true value is when you implement. 1) Slash the bottom 80%, which frees up significant new time, energy, space, and (possibly) money to re-invest elsewhere, business or personal. 2) Then, using some (or all) of your newly-available resource, “Double-down” on the top 20%. Ditched the bottom 20% of (nightmare) clients? Amazing – now hit the gym 4x instead of 2x. Or come home for dinner with the family at 5pm instead of 630pm. Or go to bed an hour earlier. Perhaps dropping the bottom 80% is too extreme for you. OK. But for heaven’s sakes, cut the bottom 20% that brings you 80% of stress! If your finger is trembling on the trigger, not quite convinced to swing into action, read this important blog post about “Opportunity Cost“. Most humans – entrepreneurs included – ignore this concept to their great peril. In fact, anyone who truly owns the reality of Opportunity Cost in their own life can’t help but race to implement 80/20 in their life as far, wide, and quickly as possible. What Opportunity Cost is playing out in your life right now? For goodness sakes, start right here and now. Doesn’t have to be heroic – just start somewhere. Give away the 10 books you know you’re never going to read. Donate that bottom drawer of clothes you haven’t even slid open in the last 24 months. Call the gossipy, energy-sucking friend that wants to do dinner and downgrade it to a coffee to minimize her damage on your psyche. You already know what the Bottom-20s are – don’t kid yourself. Now do something about it! Name one activity/thing/person that you’re going to focus less time on so you can focus your time/money/energy on what really matters, leave me a comment below! And most of all, remember you’ve got only one life to live. You’re the author of it. Join me on the 80/20 journey. 2) Getting people to follow them! A big factor in this is a person’s Kolbe score, which is outside the scope of this post. Assuming your empolyee(s) are good at following directions and following through on task, then the “Triple Path of ReadershipⒸ” strategy will help you get systems written efficiently, and will maximize your odds for team members to stick with systems over the long haul. Triple Path is a strategy I devised from building systems into my own companies. When starting to systemize any process, don’t bother with documenting every single step. Your team will (probably) get bored really quickly and (possibly) drag their feet. Instead, just have them write out the “Intermediate” path. Don’t bother writing the “Beginner” steps at all, just leave them blank. If you’re using this procedure a LOT (it’s a Top-20 procedure), and/or you’re regularly training new people with it, then go ahead and add the Beginner steps. Otherwise, just leave them blank. As for the “Expert” path, work with your team to make sure the quality control is achieved, in the fewest reasonable steps possible. Whereas the “Intermediate” path is your team’s responsibility, the “Expert” path is ultimately yours. It’s up to you the business owner to give people the Vision, Resources, and Definition of Done of how you want things done. Own that, do a good job communicating it, and your team will have a clear target to shoot for. For tasks you repeat, including macro-tasks that involve multiple, smaller procedures used sequentially, use Teamwork PM (project management software. Create the Macro-task as a “Task List”, then each step is a procedure. If someone is High Quick-Start, Low Follow-Through, (i.e they like to move to different tasks without having a need to finish other tasks first) they will (probably) never create *or* follow the systems you desire. You’re setting these people up for outright failure if you ask them to operate in a highly systemized situation. By contrast, if someone is Low Quick-Start, High Follow-through, and they have the required motivation, personality, skills and training, they can probably run your systems for months and years very successfully! Click here for more info on Kolbe scores, which goes into detail on Quick-Start, Follow-Through and what it can mean for your employees and placing each person in jobs that fits how they instinctively work. Systemizing a business can be the pathway to so much freedom, speed, ease, and enjoyment for EVERYONE – entrepreneur, teammates, and clients too. Using the Triple Path of ReadershipⒸ, along with the right tools and people in place, allows your business to streamline and scale up with surprising speed. Do you struggle with following systems or do you have a team member that can’t follow a procedure to save his life? Leave a comment below and let me know if you think Triple Path of Readership can help in your organization. 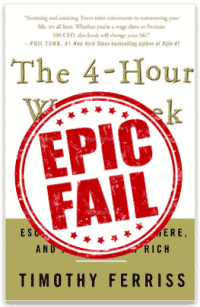 I’d just read The 4-Hour Workweek by Tim Ferriss. Foaming at the mouth, I lusted to get started with “Lifestyle Design,” set up my “Muse,” and travel the world. Race motorcycles. Set world records in tango. I hired a full-time VA and braced myself for the inevitable avalanche of cash coming my way. I was bleeding cash faster than ever. Dream shattered in 90 short days. Since then I’ve learned the problem wasn’t my VA – every business on the planet has people to pay. I mean, I was making a few bucks here and there. On the weekends I was a touring drummer making a little cash from playing shows in drowsy, small-town bars across Alberta, Canada. On weekdays I had a few other deals bringing in a few more dollars. All in all, just enough to avoid getting a job. But barely enough to get by. And certainly not enough to justify a $3,200/mo VA.
MY VA MADE MORE THAN I DID! Obviously you can only shed so much financial blood before something’s gotta give. I swallowed my pride, fired my VA, and torpedoed my 4HWW dreams. I was back to being a one-man-band, no closer to riches or traveling the world. While contemplating my (newer, now-profitable) business a few years ago, a curious section from The 4-Hour Workweek popped to mind. Towards the start it emphasized Tim’s painful beginnings. Where was it – Chapter 3? Chapter 1? There it was in the Preface (Page 15, “Chronology of a Pathology”), literally before Chapter 1 even hits. Here Tim describes how he struggled MIGHTILY from 1997 to 2004 to figure out his Money-Making Formula. As in, how he’d make money as an entrepreneur. Once he had cash rolling in – and only then – it took another two full years (2004-2006) to discover and refine his Work-Less Formula. All told, Tim Ferriss took 8 or 9 years to solve the Rubik’s Cube of his own 4HWW life. Turns out he didn’t just hire a VA to make all his troubles go away. Wow do I feel like an idiot. “Live and Learn” as they say? I sincerely wish I would have read the stabilizing, empowering message of So Good They Can’t Ignore You by Cal Newport. Where The 4-Hour Workweek gives you a thrilling, intoxicating vision of what’s possible, and guys like me and Sam Carpenter (author of Work the System) give you nuts-and-bolts mechanics of how to Systemize your business, Cal Newport reattaches your feet to the ground and gives you SOUL. The harsh fact is no one will give you money for nothing. You aren’t a charity. You’re an entrepreneur who exchanges solutions for money. As such, you need to get good at something. It’s gotta be an in-demand service or product which people are ready to spend money on. And the more in-demand your solution is, the more you get PAID. This is the crux of Cal’s book, So Good They Can’t Ignore You. Once you’ve done that – the basics of your Make-Money Formula are established – and you’re making a decent, full-time income, THEN it’s time to start Systemizing, hiring a VA, and (possibly) considering how you can cut your workload and travel the world like a rockstar. My Warning to You: skip this step and you’ll blow fat stacks of cash like I did. Elsewhere on this blog I go into greater detail about “Level 2” businesses. In short, don’t bother hiring VAs until you’ve got a good, full-time income coming in from your business. You’ll have enough cashflow to handle the expense of a part-time VA. Enough of your business will be figured out and you’ll put your VA to work in useful ways. You’ll have enough work week-to-week to keep a VA employed and focused. And – for goodness sake – you DON’T need to dive into a full-time, $20/hour VA in the beginning. My income is now multiples of what I used to make, yet I still don’t have a $3,200/mo, full-time VA like I used to when I lost $10K in the blink of an eye. Boy did I learn A LOT. How much should I pay an Assistant to start? How do I let go of control/can I trust them? Where do I find good candidates to become my Assistant? How do I train my Assistant? How do I manage my Assistant once I get them going? If you’re interested in this Guidebook, put your name and email below and I’ll send it to you right away. If you’re willing to share, what hard-hitting lesson have you learned the hard way on your journey of becoming an entrepreneur? Reply in the comments, I’d love to hear what lesson(s) you’ve learned. P.S. Just so there’s no confusion here – I thank sincerely Tim Ferriss for significantly expanding my worldview. And for writing one helluva a sales lett…um, book. What a world-class bit of copy! Wouldn’t be here without all the explicit and implicit lessons that came as a result of his book :). Even though my business has over 150+ systems, I personally wrote fewer than 20% of them. Follow these tricks to get systems setup as fast as possible. Usually an entrepreneur will see the value of checklists and put them in place quickly. Or they’ll read a great book like The EMyth or Work the System, get excited and start writing out checklists and procedures. …so they just assume “my business is different – systems just won’t work”, and give up. When you understand the Holy Trinity of Systems you can be one of the few business owners that makes the leap…. successfully. You’ll write your 20-40 Decision-Making Guidelines (DMGs) in a single document, ideally in Google Drive. They’re the recommendations / guidelines outlining how you want people to act in your business. The better your DMGs, the fewer procedures you need to write, and the fewer steps you need in each Guideline. And with DMGs in place, your team can still take action and help you day-t0-day, even when they hit curve-balls that DON’T have a written procedure. DMGs are your “catch-all” when there’s no procedure in place. You’ve probably heard of the bestselling book The 4-Hour Workweek by Tim Ferriss. He explains how he was getting a TON of emails – over 1,000/week – from his customer service team, and it was getting harder and harder to answer them all as his business grew. I would like to establish a new policy for my account that overrides all others. Keep the customer happy. If it is a problem that takes less than $100 to fix, use your judgment and fix it yourself. This is official written permission and a request to fix all problems that cost under $100 without contacting me. I am no longer your customer; my customers are your customer. Don’t ask me for permission. Do what you think is right, and we’ll make adjustments as we go along. Instantly he slashed the volume of emails he was getting from over 1,000 / week to fewer than 20 / week. This is what we call a “Decision-Making Guideline”. Filip from the Czech Republic wrote us. One of our podcast episodes wasn’t playing properly and he was a little upset – he was looking forward to hearing it! To be clear – I have NO procedure in my business that says “What to do if a guy from Europe writes to say our podcast isn’t working”. Nor will I EVER have that procedure. 1. You are an ambassador of me, Tim Francis: I am a responsible, caring, and courageous gentleman. I expect you to act accordingly. I expect you to respect and demonstrate tolerance for cultural, political, racial, and lifestyle differences in all those you come in contact with. TFM is not a place or channel to voice your political, racial, religious, or lifestyle thoughts or judgements. Nor is it a place to promote your other interests, business opportunities. Not to our clients, not to me, nor to your other team members. She immediately wrote Filip to apologize for our error and let him know she’s fix the issue and keep him posted. 9. How We Handle Mistakes: As long as all team members are following (in detail) our in-house documentation and instructions, all mistakes are blamed on system weaknesses NOT people weaknesses. Mistakes aren’t encouraged, but we DO embrace them when they happen. We work as a team to figure out the system weakness and fix them once and for all. We do NOT repeat mistakes. If a mistake occurs: 1) put out the fire, 2) immediately fix the system weakness that caused this fire in the first place, then 3) – once approved by a supervisor – distribute the new, improved Procedure to affected team members. Sarah then found the issue, fixed it, notified Filip everything was working, then updated the procedure so we’d never have this problem again. 23. Our Work Reveals our Character: For example, sloppiness and laziness reflect on our character. So do perseverance and caring consideration. 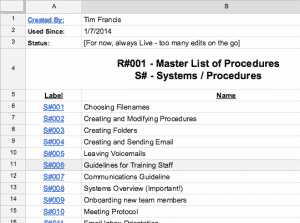 Now that your staff knows how to write procedures, they can take care of it in your place. You may or may not be involved in the solution, but you are NOT the one writing out the steps. Often I’ve shot a 5-min video describing my desired solution / outcome, then sent the video to my VA and she’s written out the steps. Gold. They do NOT need to be a college graduate, award-winning employee or anything like that. They *do* need to have any other specific credentials / training specific to their role. For example, if you want an in-house graphic designer, you probably want someone who already has skills with Adobe Photoshop or InDesign. 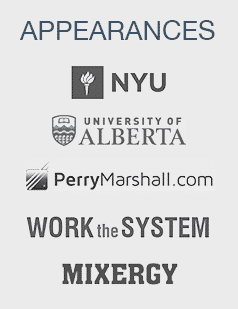 See how the above person is instantly setup for success within a systemized business? They’re predisposed for success. Not only will they accept the structured environment of a systemized business, they’ll appreciate it! Skills you can generally teach. WordPress, Aweber, Infusionsoft, etc, can be taught quite easily to the above person. But try to hire an Aweber expert who hates checklists and you’ve got a world of hurt coming your way. Use my “Perfect Job Posting” to get a winning applicant. So now you’ve got systems-minded people running your business. When a curveball comes up that isn’t covered by a procedure, your team still has guidelines on what to do. And when a weakness is revealed, your team knows how to create and modify procedures so you don’t have to. The “Holy Trinity of Systems” has saved my bacon more than once, and has saved me literally HUNDREDS of hours. Leave me a comment with ONE Decision Making Guideline you can implement with your team immediately. P.S. Not sure how to start your Procedures for Making Procedures? Download my copy here so you can copy and modify to fit your business’ needs.